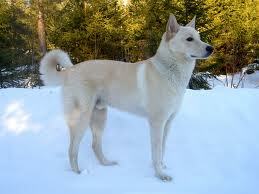 The Canaan Dog originates from the Middle East and has a relatively small population the UK. 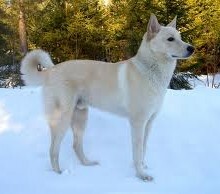 He is a medium to large dog, generally versatile and typically will warn when strangers approach your home. He has a short, dense coat which needs regular grooming. He is typically strong and energetic and will need plenty of exercise every day. He is more suited to life in the country than in town. Hip dysplasia: breed mean score 9.5 (parents should be lower).